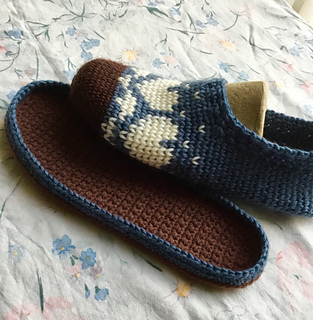 These slippers are designed for the pure joy of being able to knit colored patterns with my hook! 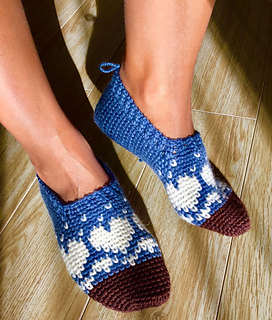 The heart-pattern with the traditional “lice”-stitches, is an overcoming challenge as a first approach to this super-fun technique! 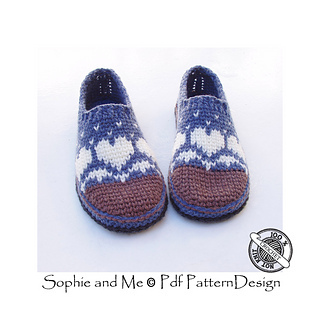 See the Snow Heart pattern used on the Snow Heart Hat. 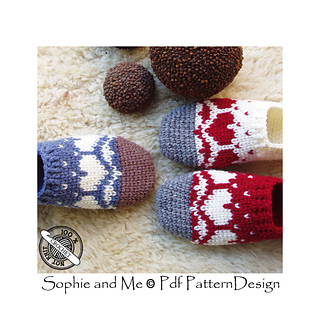 See the Snow Heart pattern used on the Snow Heart Mittens and Fingerless Gloves. 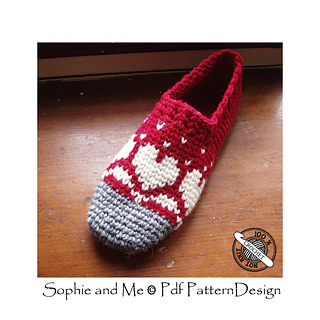 OR buy the E-Book KNIT with your Hook - 3 Snow Heart-patterns! Not Tapestry, not “normal” crochet. Officially the stitch is called Waistcoat stitch, or Split Sc. 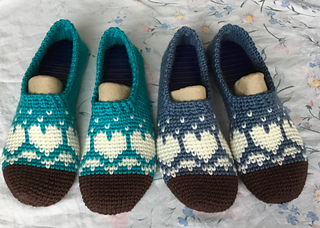 Same technique as for the Crochet/Knit Clog-Slippers, and the Crochet/Knit Casual Slippers. I’ve tried to demystify working with colors, without too much fuss. This is a no-stress, no-hurry project! Slow-down, relax, enjoy every stitch! 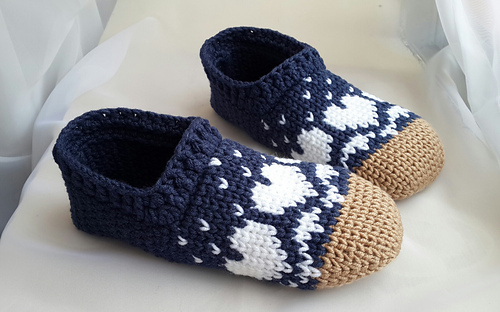 See photos of a customer’s samples, she has worked this pattern in solid colors only! 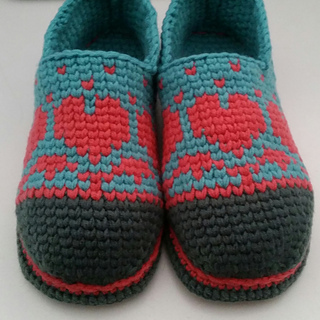 Crucial skill: You need to understand colored pattern-charts, like in knitting, or cross-stitch embroidery. Take it easy, and enjoy! 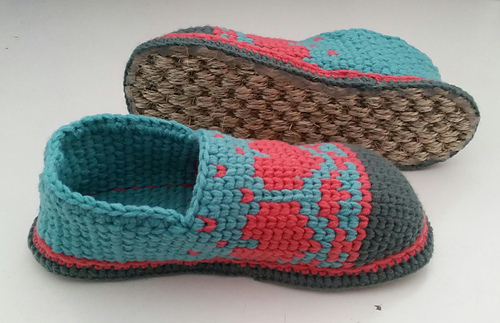 Optional: Protect your slippers against wear and tear, join crochet soles to the bottom! Warm and comfy! 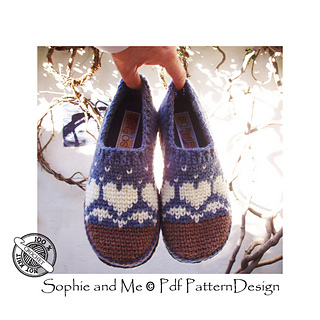 14 pages written instructions with colored stitch/pattern diagram for all sizes, step-by-step-pics and tutorials. Shoe size about US 1-4 - EU 32-36. Any brand and quality suitable for the project, obtaining gauge in instruction. My yarn: Bravo/Schachenmayr by Coat. Total amount, 3 colors: About 75-100 g, (2.5-3.5 oz), depending on size. 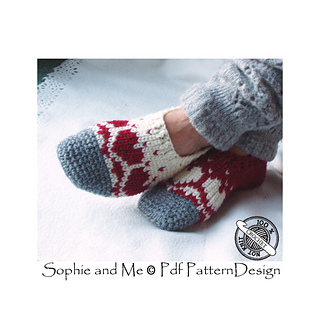 Basic color: 1 skein + small amount for toe-cap and heart-pattern. Hook: 4 mm (G/6), or any size to obtain gauge in instruction. 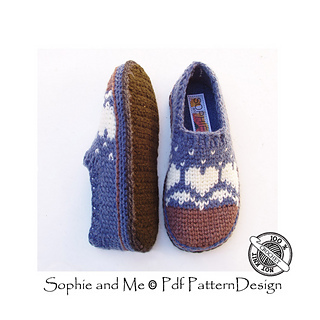 See images of blue slippers with soles on this page. 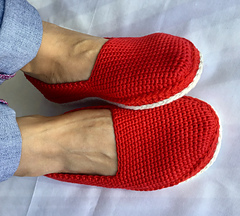 Joining customized crochet soles to the slipper bottoms, will extend the lifetime of your slippers, protect them against wear and tear and make them more comfy, warm and sturdy! 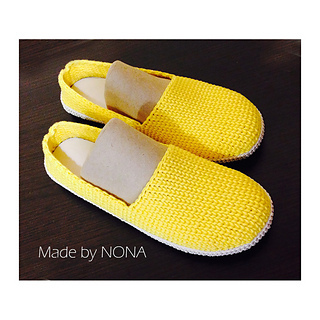 Inserting customized insoles, will add extra comfort and softness to the slippers. 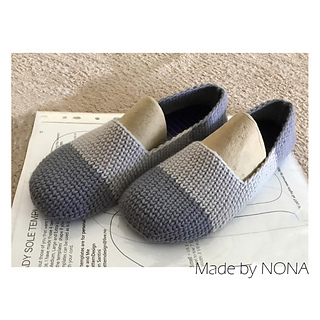 It looks nice, and keeps the slippers in shape. Personalize the insoles with matching fabric and labels! 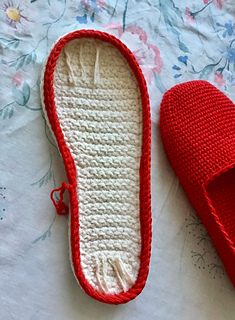 Join out- and insoles to your crochet-slippers, and you will achieve a pair of long-lasting, warm, and extra sturdy home-shoes! 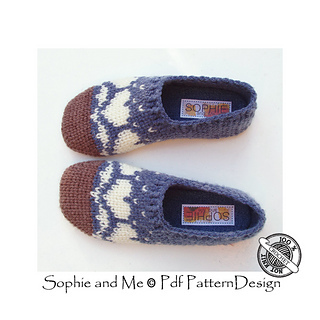 OR purchase the E-BOOK: Basic-Slippers + Sole-Tutorial/pattern HERE!